Cologne based Boxer Recordings mark their 100th release. 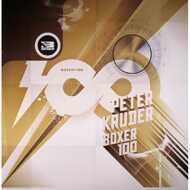 And Peter Kruder, one half of Austrian duo Kruder & Dorfmeister, has the privilege to deliver the soundtrack for this anniversary, with his three track EP "Boxer 100“. "DumDaDuDap“ might appear a bit simple at first glance, but surprises over the lenght with elaborate programmed sequences, effects and a perfectly arranged break.